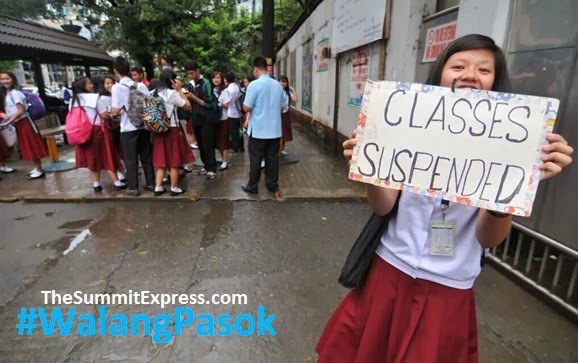 Manila, Philippines - Local government units (LGUs) and some colleges and universities announced suspension of classes for Monday, September 23, 2013 due to inclement weather situation (heavy rains and flooding) as an effect of Southwest Monsoon (Habagat). Class suspension list will be updated as soon as new announcements are made or reported. For areas and schools not in the list, it means there is no announcement yet. This is based on our TV, radio and online monitoring. In the latest bulletin of PAGASA, it says that Metro Manila, Central Luzon and CALABARZON will experience cloudy skies with moderate to occasionally heavy rains and thunderstorms which may trigger flashfloods and landslides. MIMAROPA and Bicol Region will have cloudy skies with light to moderate rainshowers and thunderstorms. Northern Luzon, Visayas and Mindanao will be partly cloudy to cloudy with isolated rainshowers or thunderstorms. Here is the list of class suspension (#WalangPasok) for Monday, September 23, 2013.